Passes are designed almost exclusively for non-sharing members (Fon Visitors/Guest users), to access the internet through hotspots. The most common passes are 1 hour, 1 day, 5 days and 30 days, and are available for sale connecting to hotspots. Passes can be used only on the network/country where they were purchased. 1 Hour Pass: Provides 60 consecutive minutes of unlimited connection (expires 60 minutes after purchase). 1 Day Pass: Provides 24 consecutive hours of unlimited connection (expires 24 hours after activation). 5 Days Pass: It's a bundle of 5 individual 1 day passes. Once you activate the first day pass, a timer will be displayed showing the time remaining for the current 24h connection time period. It will expire after 24 hours, while the 4 remaining day passes will be credited to your account for future connections. 30 Days Pass: Provides 30 consecutive days of unlimited connection (expires 30 days after activation). For the moment, it's only available on SFR, KPN and MWEB networks. Passes activate right after they are purchased - if you ticked the bullet "Use pass immediately after purchase" during the purchase process, unless a previous Pass is still active. In that case, they will be credited to your account and won't expire until you decide to use them, on the network where they were purchased, valid during 365 days after the date of purchase. For your information, passes are not subscriptions. Subscriptions normally generate direct debits all along the subscription duration; however when you buy a pass, you are charged at the moment of the purchase and when the pass duration expires you need to make a new purchase to keep enjoying the service. In the UK and in France, passes are also available offline, which means you don't need to be connected to a hotspot to buy them. Instead, you will be able to access the website corresponding to the country in which you wish to use the service, no matter where you are at the moment of the purchase. Passes purchased offline are credited to your Fon account and you have 1 year (from the date of the purchase) to activate them. As for passes purchased on hotspots, these will be usable only on the network where they were purchased (BT Fon passes can be activated only on BTWiFi-with-Fon hotspots, and SFR Fon passes only on SFR WiFi FON hotspots). Access can also be obtained using Promocodes, generally provided by Fon commercial partners (e.g. airports, hotels, loyalty programs, accommodation community marketplace, etc.). The connection time offered can vary (unlike passes), as it will be determined by the assigner of the promocode according to the campaign in course. Promocodes must always be redeemed from a hotspot login page to get access to the internet. 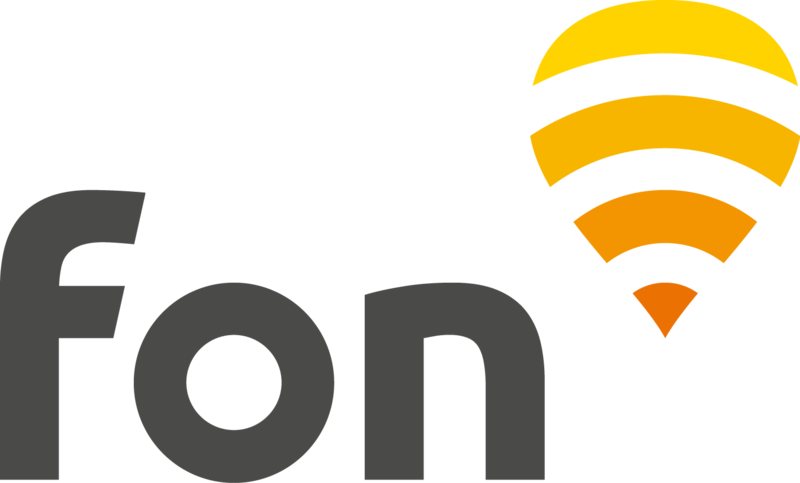 A promocode activated on the Fon network cannot be used on the Vodafone network, and vice versa. Look to see if the WiFi signal of one of our partners is in range of your device and if so, connect to it. Open your web browser and wait for the login page to load. If it doesn't, type any web address, i.e. "www.bbc.com" into your browser's address bar. Click on the link or button called "Redeem promocode" (or similar). Sign up to create your Fon account or sign in if you are registered already. Once logged in, insert the code to receive your free access. You're ready to surf for free! Should you disconnect before the end of the connection time expired, simply log back in with the same credentials to keep using your pass. As a pass or promocode user, you will be able to take full advantage of the brand new Fon WiFi app! Purchase passes or redeem promocodes, and use them seemlessly as the new Fon WiFi app connects your device automatically to the nearest hotspot in range. For now, the app is available for download in all countries except in the UK, and Portugal. Will be released in these countries very soon. Despite the app can be downloaded from anywhere, the pass sale through the app will be available in France, Italy, Hungary and Australia exclusively. However, you'd still be able to use the passes bought through any Fon hotspot portal on the app, to connect seemlessly. More details in Fon WiFi app help center. Some networks offer the possibility to try the service for free. This is a very convenient way to check the quality of the WiFi network you are connected to. Look to see if one of these WiFi signals is in range of your device and if so, connect to it. Click on the link or button called "Free trial" (or similar). You're ready to surf for free! You will be able to use the free trial once, every week or month depending on partners. Next step: please click here in order to know how to purchase passes in a specific country (refer to the First pass purchase instructions). A WiFi capable device with a web browser i.e. laptop, smartphone or any other WiFi device which has a browser. A Fon account (you will be asked to create one during the purchase process). You will be required to login each time you connect to the internet through a hotspot, so we recommend that you mark the "Remember me on this computer" checkbox. If you wish to disconnect from a hotspot, simply disconnect from the WiFi signal or switch off your device. There is no need to log out. Remember that it is not possible though to connect to different hotspots using the same account credentials at the same time.